The Seven of Cups tarot card represents that portion of our journey through the Minor Arcana where our imagination is in full swing. It represents a time of choices, wishful thinking, and the dreams of our youth coming before us to drive us forward. It can represent the appearance of gifts and prizes, or a sudden windfall. 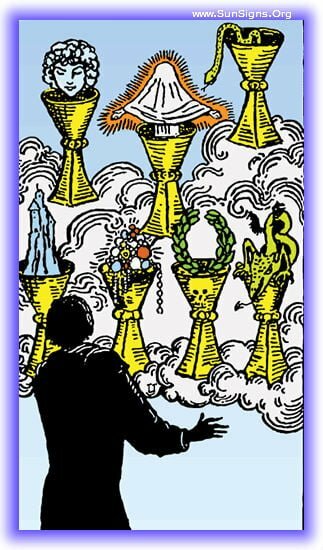 The Seven of Cups indicates that in order to make our dreams and fantasies come to fruition, we have to take the proper actions to build them into reality. The warning in these cards is living in the fantasy world, it is a call to action. But in that action, we need to stop and make sure that what we dream of is actually fully recognized, lest the pie in the sky dreams cover our eyes in illusion. 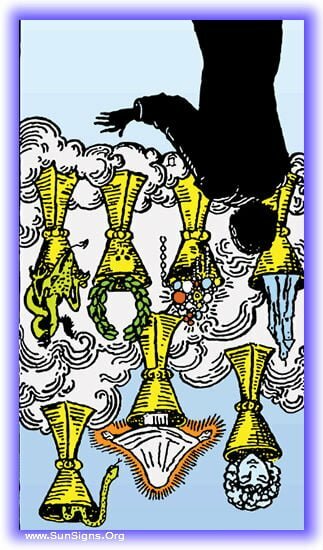 Seven of Cups upright corresponds to some active imaginations and desires. You will often have some contradictory desires and daydreams. Sometimes you will have a lot of opportunities in front of you. You need to make your decisions after carefully judging all the aspects of an issue. Several choices will be thrown open in front of you that hold great promise. However, you need great degrees of perception to visualize it. So, this is the phase to support your plans with hard labor so that you may achieve your objective. You may also encounter an exciting and spiritual experience. Lastly, a few words of advice – stay away from irrational thinking, silly whims and impractical attitudes. You’ve been living in a dream world, but there is nothing wrong with that. This Rider Waite card appearing in your past indicates that the time for dreaming is past, and the time for action lay before you. Take all those dreams you’ve been dreaming, and refocus your efforts on making them a reality. The Seven of Cups in this position is a call to action, your dreams have been living with you for quite a while, and you’ve got some really good ideas, but if you don’t start moving forward with them they’re going to just wilt into could have beens. Assess them for possible dangers, and move on. Not all of our hopes and dreams are good for us, with this card in your future there is a warning against taking advantage of an opportunity that’s about to present itself. It may be an affair, a one-night stand with someone you’ve been wanting, or even a business opportunity that sounds too good to be true. For your own sake, avoid it. Yes! Now is the time to act and make your dreams and goals come to pass. You are in an excellent place to bring about those things you want in your life. The Seven of Cups reversed is a warning that we are being seduced by illusions and temptations. It’s time to examine yourself closely and determine whether or not your current activities are merely an attempt to avoid reality and not deal with the real problems in your life. Seven of Cups in the reversed position symbolizes power of correct perception and a capability to understand your own desires and dreams. You will boast of strong determination and resolve. However, you need to control your energy and give it proper direction so that some of your conceived valuable ventures can gain from it. You will be able to make some smart choices guided by your strong sense of resolution. However, the flip side is that you tend to rely on fake hopes and sometimes suffer from self-delusion and hesitancy. These negative traits could cost you dear as you may loose some exciting opportunities due to your indecisiveness and inaction. This tarot card present in your past indicates that you’re finally breaking through the veil of illusion that’s been drawn over your eyes. It has allowed you to see things as they really are, and accept your actual truth. It’s time to face reality, you’re living under the auspices of a well crafted illusion you yourself may be working to keep up. This whole thing is just a way to distract you from the reality of your situation, open your eyes, clear it away, and you’ll be able to deal with what’s present. There is a moment of clarity coming, and it’s going to be jarring. You aren’t prepared for the fantasy you’ve been living in to fall away, but it’s going to. The only thing you can do to deal with it right now is to face the reality on your own, before it’s forced on you. No, things are not how you think they are, and deep down, you’re well aware of this fact. Open your eyes to the reality of the situation and try again. Get Free Tarot Readings Now!